Astronomers have observed that the universe is expanding, and this means that at some time in the distant past the universe was squezzed into an incredibly tiny space. Having the matter and radiation for the entire universe squezzed into a tiny space implies that they are under enormous pressure at an extraordinarily high temperature. Because ordinary explosions are events of high temperature and pressure, the beginning of the universe is (erroneously) compared to an explosion, an explosion called "the big bang." But what kind of evidence supports the "big bang" hypothesis, after all there were no human observers of this event? Let's use the same logic on this problem that we would use for ordinary objects. How could we determine whether or not an oven had been used recently? Well, if the oven is warm to the touch, we know that it has probably been used within the last hour. By the same token, if the universe were hot enough in the distant past, then it is possible that some of the remnant heat is detectable today as blackbody radiation . Where is this residual radiation seen? Because the big bang created the entire universe, the remnant heat, called the Cosmic Microwave Background (CMB), is seen at any place in the sky above the earth's atmosphere where radio telescopes are pointed. 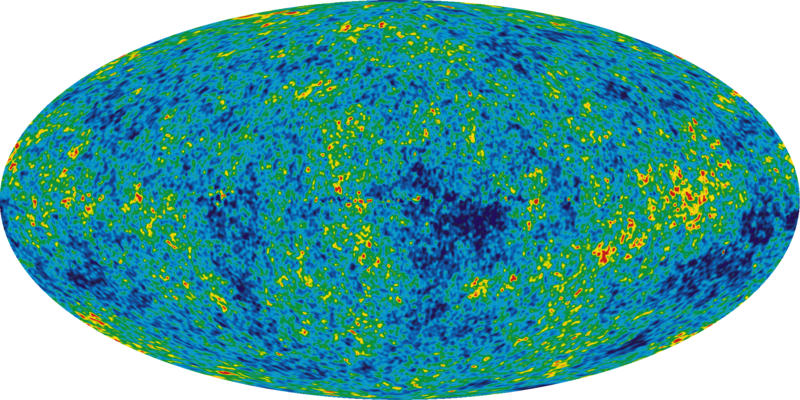 The CMB is not smooth, however, because the radiation has scattered from matter at 380,000 years after the big bang. Fluctuations in the CMB were first measured in 1992 by the DMR(Differential Microwave Radiometer) instrument (7 degree angular resolution) on the Cosmic Background Explorer (COBE) satellite, and are shown below. In 2012, after 9 years, the WMAP instrument (20 arcminutes angular resolution) produced a more detailed map. Even more detail is revealed in the 2013 Planck data (5-33 arcminutes angular resolution).